Hello, all! I’m still somewhat in and out of blogging right now, but I wanted to share a post that I helped with over at the Volition Beauty Blog, Collectivity. Check it out to see my suggestions for teas to try as the weather cools down, along with a recipe for my favorite Five-Spice Tea Cake. And check out my Volition Beauty campaign! Hello, strangers! 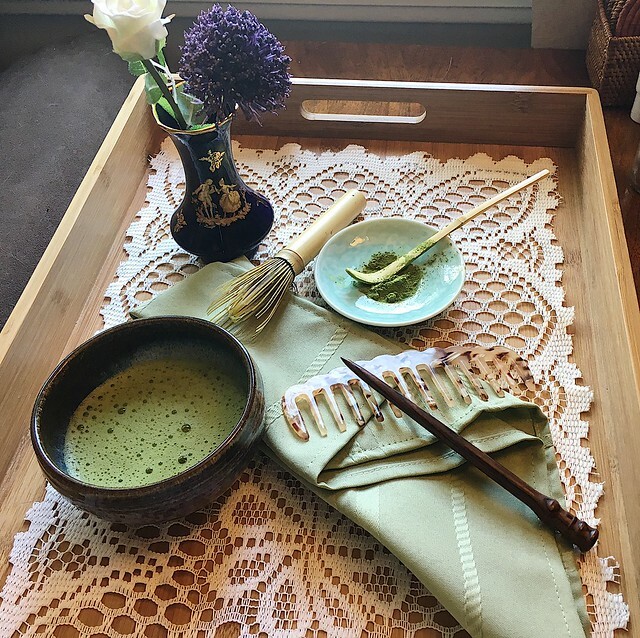 It’s been a while since I’ve blogged, but I thought I’d make this week Matcha Week, in honor of my continuing campaign over at Volition Beauty. I only have about a month left to get the votes for my dual-targeted matcha hair mask, so I’d love it if my readers would help support me in this. I’ve talked about my hair double-masking practice in the past, and I think it would be so cool if a commercial product could be made aimed at this idea. Please head over to this link to vote for my campaign, and please feel free to share the link at your own online space. I can use all the help I can get! 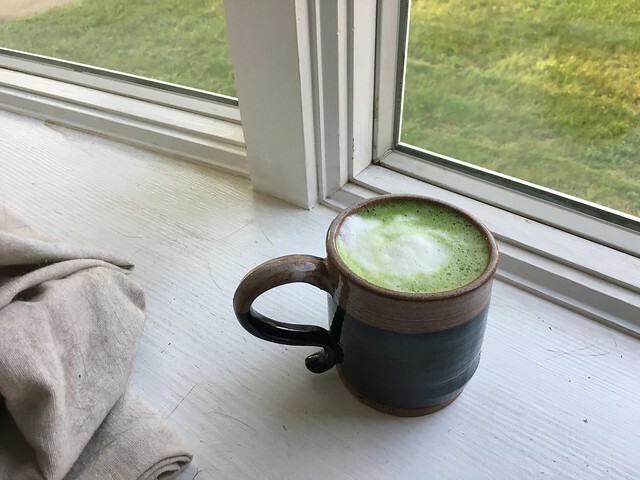 So to highlight matcha today, I’m going to talk briefly about matcha lattes. While most of my matcha is consumed in bowls of traditional thin matcha, I sometimes just want a little more of a treat. Especially with the weather cooling down, a hot matcha latte is a great alternative to hot chocolate, although I still enjoy an iced matcha latte before I go to the gym sometimes. For a hot matcha latte, I’ve started using my higher grade matcha because I find that the better quality matcha means that I can use little or no sugar in my latte. I simply mix 1 to 1.5 teaspoons of matcha powder (or 2-3 chashaku scoops) with about an ounce of hot water, and then top it with hot frothed milk. My favorite matcha for this is my Matchaeologist Meiko matcha, which is their lowest-priced ceremonial grade. This is a matcha that is lovely made just with water, but still has enough oomph to cut through the richness of the local whole milk in my latte. For an iced latte, I could just use the same procedure as above, but use cold milk and pour it over ice. 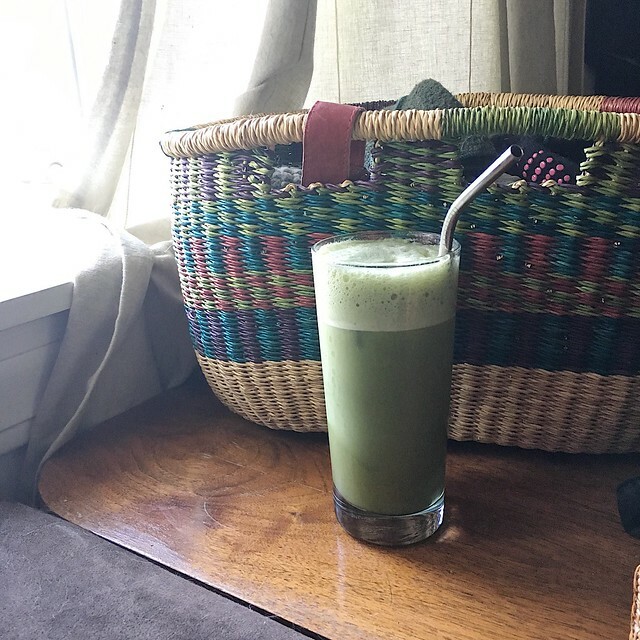 But when I’m going to the gym, I sometimes find that dairy upsets my stomach, so I’ve created a vegan iced matcha latte using high-quality unsweetened almond milk, culinary-grade matcha, and a little bit of maple syrup to make up for the lack of milk sugars. My standard recipe is to put 2-3 scoops of Matchaeologist Midori matcha in the bottom of a mason jar, and then add 2 tsp. of maple syrup and 1 oz. of hot water. I stir this together and then pour in 8 oz. of cold unsweetened almond milk (Three Trees brand is my absolute favorite, but it’s expensive, so I also like New Barn). I then cap the jar and shake it vigorously until everything is mixed together, and then pour it over ice. If I’m having it before the gym, I can add a scoop of collagen protein for an added boost. This is also quite a refreshing post-run drink during the summer. So that’s today’s offering for Matcha Week. Join me back here on Wednesday and Friday as I share more ways I use matcha besides just mixing it with water in the traditional style! NB: While the matchas I mentioned in this post were purchased with a discount for review, all opinions are my own. For more information about sponsorship, see this page. Links are not affiliate links. I’ve got a rather exciting announcement today. For the last few months, I’ve been working with Volition Beauty to develop an idea for a commercial version of my hair multi-masking technique and yesterday, the voting campaign went live. Meet the Dual-Targeted Matcha Hair Mask. Now, the way this works is that Volition mocks up the idea and puts it up for a vote. If enough people vote for a product, they develop it into reality. So now begins the process of asking you, my readers, to help me bring this truly into reality. A bit about the product idea: I’ve written in the past about how I use a double-masking technique to address the different needs of my hair versus my scalp. I brought this idea to Volition and they came up with the additional idea of infusing the ingredients with one of my favorite things: matcha green tea. The scalp mask is targeted at reducing scalp oil, while the other will contain ingredients aimed at nourishing dry length. Of course, the product will be free of sulfates, and will take advantage of both the nourishing and stimulating properties of green tea. So, please take a look. Voting does not obligate you to buy the product, but if you decide you would like to buy it in the future, voting gives you a little discount off the list price. I’m exciting for this and I hope some others will be too.